*The sizes shown with an asterisk are New York fits, which are slightly looser around the chest and longer in the sleeves and body. The New York fits are perfect for tall, athletically built customers. 36 - 81 14.2" 31.9" 16.9" 29.9" 38.6" 33.1" 30.7" - 33.5" 25.2" - 28"
37 - 81 14.6" 31.9" 17.3" 30.3" 40.2" 34.6" 32.3" - 35" 26.8" - 29.5"
38 - 79 15" 31.1" 17.7" 30.7" 41.7" 36.2" 33.9" - 36.6" 28.3" - 31.1"
38 - 82 15" 32.3" 17.7" 30.7" 41.7" 36.2" 33.9" - 36.6" 28.3" - 31.1"
38 - 85 15" 33.5" 17.7" 30.7" 41.7" 36.2" 33.9" - 36.6" 28.3" - 31.1"
39 - 80 15.4" 31.5" 18.1" 31.1" 43.3" 37.8" 35.4" - 38.2" 29.9" - 32.7"
39 - 83 15.4" 32.7" 18.1" 31.1" 43.3" 37.8" 35.4" - 38.2" 29.9" - 32.7"
39 - 87 15.4" 34.3" 18.1" 31.1" 43.3" 37.8" 35.4" - 38.2" 29.9" - 32.7"
39 - 90* 15 1/2 35 1/2 18.5" 32.7" 44.1" 39.4" 36.2" - 39" 31.5" - 34.3"
40 - 81 15.7" 31.9" 18.5" 31.5" 44.9" 39.4" 37" - 39.8" 31.5" - 34.3"
40 - 84 15.7" 33.1" 18.5" 31.5" 44.9" 39.4" 37" - 39.8" 31.5" - 34.3"
40 - 90* 15 3/4 35 1/2 18.9" 33.1" 45.7" 40.9" 37.8" - 40.6" 33.1" - 35.8"
41 - 85 16.1" 33.5" 18.9" 31.9" 46.5" 41.3" 38.6" - 41.3" 33.5" - 36.2"
41 - 89 16.1" 35" 18.9" 31.9" 46.5" 41.3" 38.6" - 41.3" 33.5" - 36.2"
41 - 92* 16.1" 36.2" 19.3" 33.5" 47.2" 42.5" 39.4" - 42.1" 34.6" - 37.4"
42 - 86 16.5" 33.9" 19.3" 32.3" 48" 43.3" 40.2" - 42.9" 35.4" - 38.2"
42 - 92* 16.5" 36.2" 19.7" 33.9" 48.8" 44.1" 40.9" - 43.7" 36.2" - 39"
43 - 87 16.9" 34.3" 19.7" 32.7" 49.6" 44.9" 41.7" - 44.5" 37" - 39.8"
43 - 92* 16.9" 36.2" 20.1" 34.3" 50.4" 45.7" 42.5" - 45.3" 37.8" - 40.6"
The inside and outside of the collar use different patterns to create a beautifully engineered, compact design. 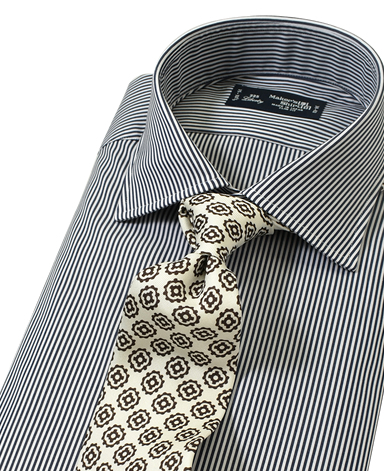 By using a technique known as shirring, we've created an elegant collar that wraps around your neck. 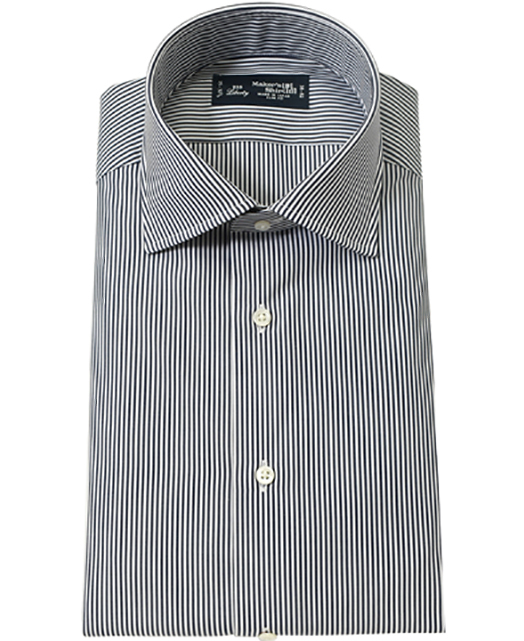 The shirt pattern has been improved by making the front panel larger and the back smaller than our previous slim fits. For a slim appearance and fit, the waist point and back darts have been lowered too. The sleeves have been made slimmer, and point forward naturally. The curve of the sleeve has been tailored to match that of the jacket, which in turn means the cuff of the shirt sleeve and the jacket are parallel. 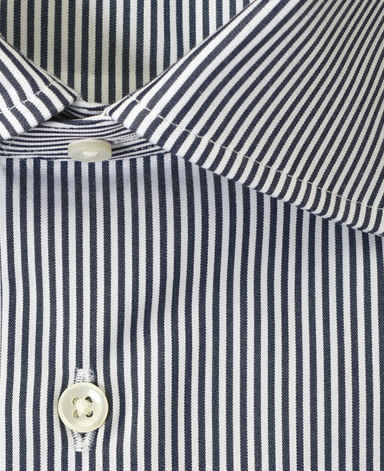 The smaller 9 mm diameter top button complements the sharp look of the collar. 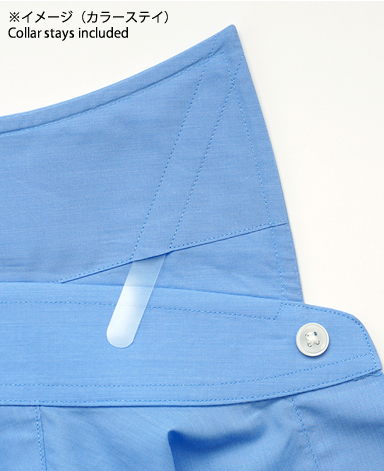 To match the elegant feel of the new model, the front placket, sleeve placket and stitch width have been narrowed.